With big flat twelve engines, minimalist aerodynamics, and seemingly infinity horsepower, the 917 was Porsche’s late-60s-early-70s experiment in building machines to terrify racing drivers for the hell of it. These weren’t really meant to win races, just to strike terror in the hearts of humanity. That’s a little known fact about Porsche, they just wanted to make scary things, and accidentally won Le Mans and Can Am titles. 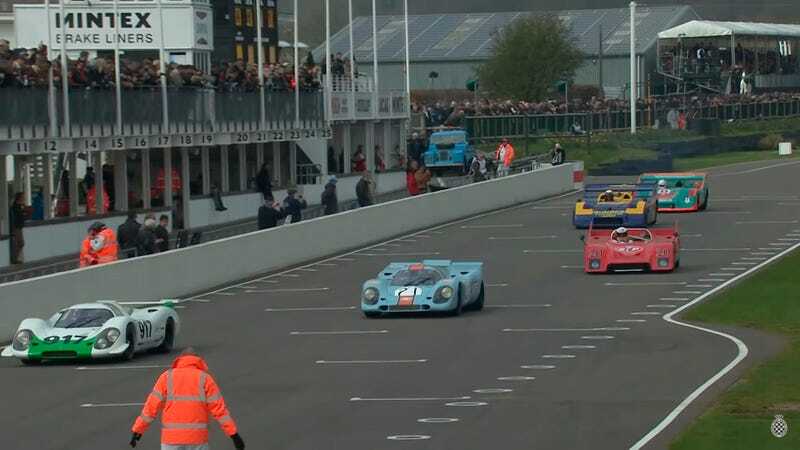 These frightening monsters rolled into Goodwood for the Members’ Meeting this weekend and scared everyone there with loud screams and big roars. Everyone ran away, and the event was cancelled. Click the video to witness the horror. Obviously that’s not true, but these big bore Porsches are mighty and awesome to witness. Crank up the volume and click that play button.